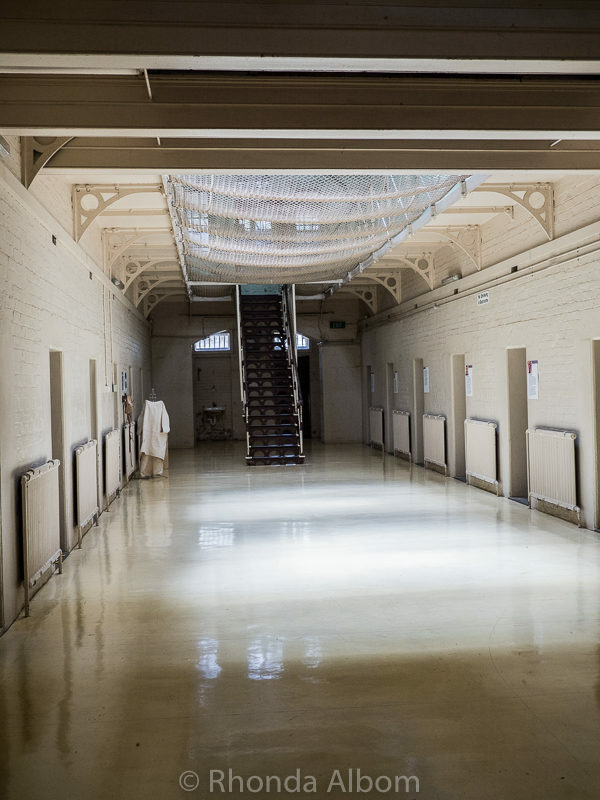 I could feel a chill run down my spine as I walked through the corridors of J-Ward, a former gaol (jail), later transformed to J- Ward lunatic asylum for the criminally insane. 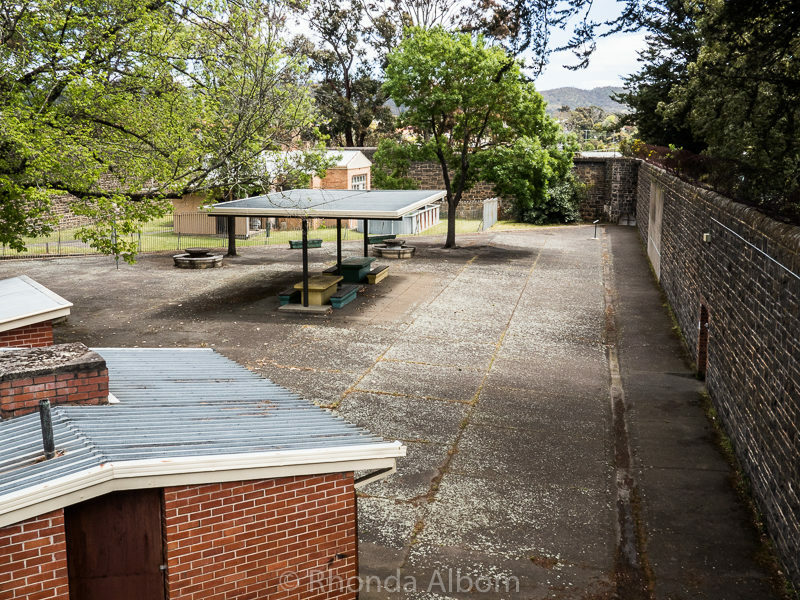 Nestled in the small town of Ararat in Victoria Australia, J-Ward closed in 1991, and many former employees and patients still live nearby. Our guide was John, a man who had grown up in Ararat and who has heard the stories first hand. As we walked, he pointed out details, paraphernalia, and unmarked graves, while he told stories that left me both mesmerised and horrified. It is these stories that make the tour so fascinating. This is J-Ward asylum’s calm exterior that hides the horrors that went on inside these walls. It opened in 1859 as a goldfield’s prison, but when the gold ran out, the miners moved on, and the building was acquired by the Lunacy Department of the nearby Aradale Asylum. 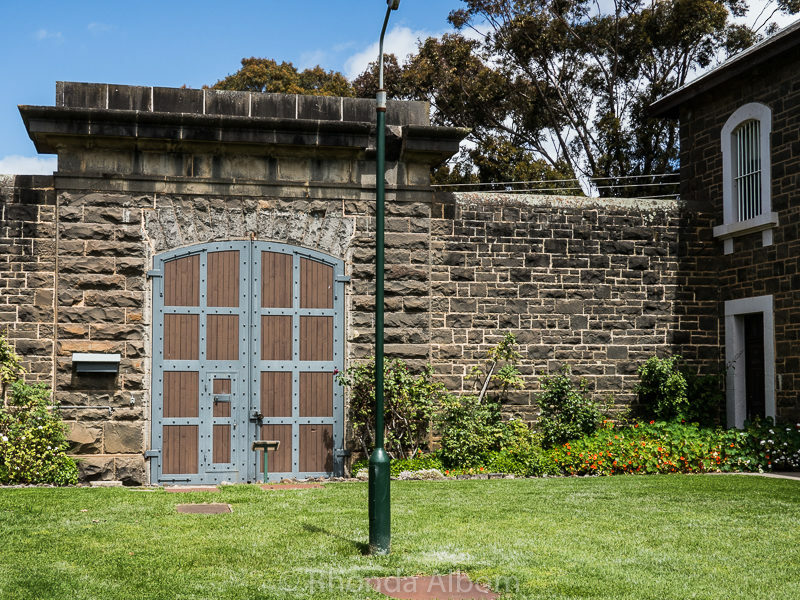 It became the hospital’s ward (J-ward) for the worst and most dangerous men in the state of Victoria. The main gate to the outside. Visitors entered through the smaller door and were in this lovely courtyard, rather than being exposed to what life was really like in the back rooms. 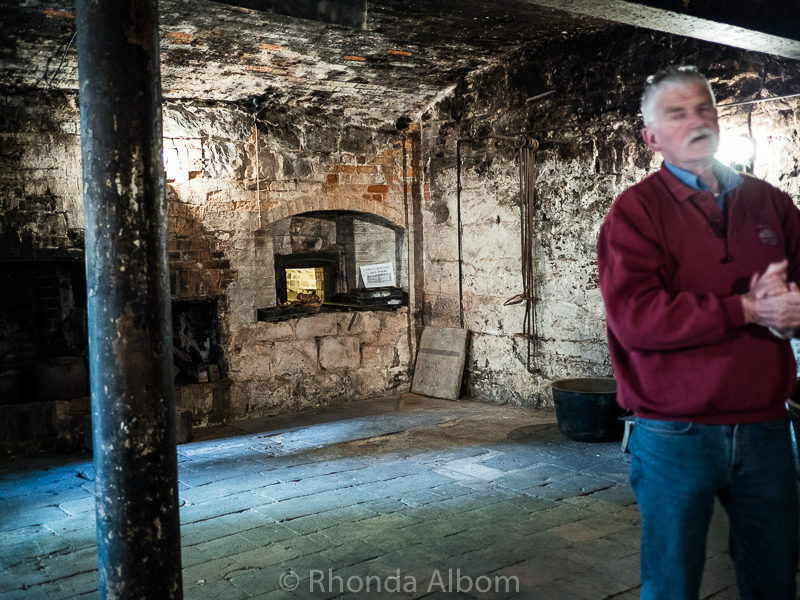 Single mans quarters – where the guards and nurses lived. The next building to the right housed those who were married. On the opposite side of the courtyard was the governor’s house. Neither he nor his family ever needed to enter the into this courtyard. 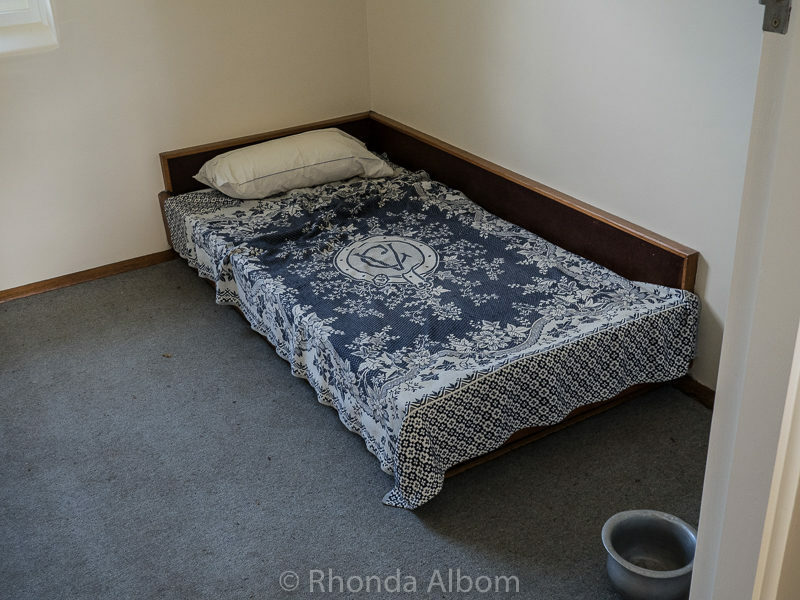 This is the bed used by patients on suicide watch, as it could not be cut up. The original cell block with similar cells just above. The gallows found on the upper level were used only when it was a prison, not when it was a hospital for the crimally insane. 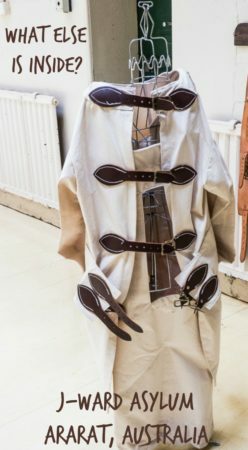 A straight jacket and restraints. 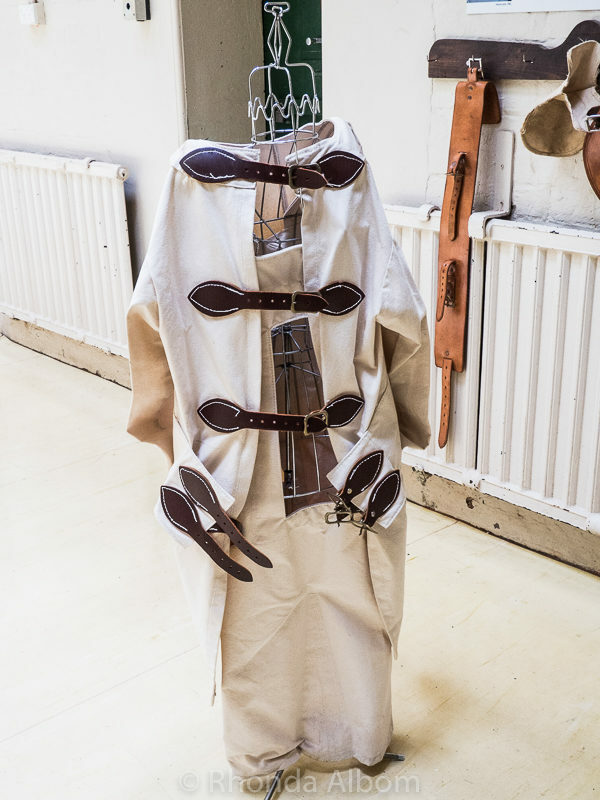 Patients were often kept in these for extended periods of time, so hands were restrained down at their sides, rather than crossing the body. Is it a Haunted Insane Asylum? If you believe in ghosts, or if you have heard some of the J-Ward Ararat stories, then you know this lunatic hospital must be haunted. If you’re brave enough, you can take an evening ghost tour. 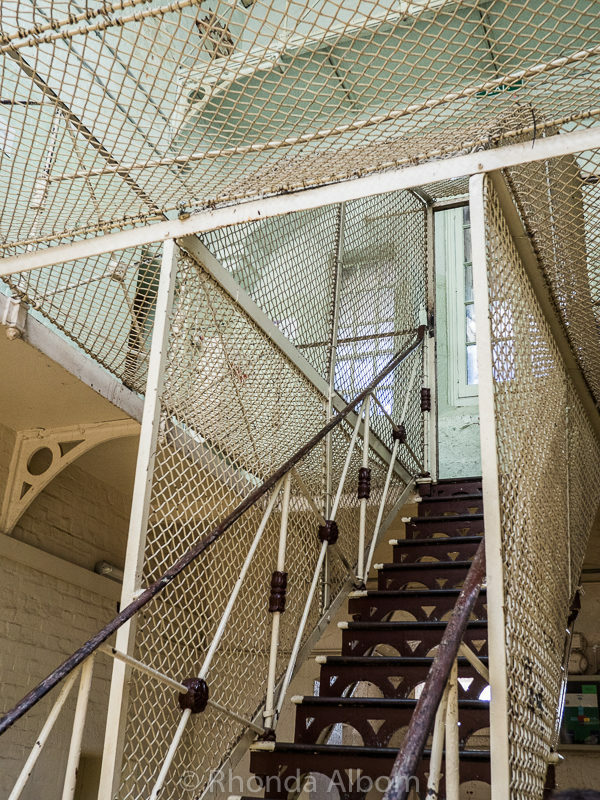 Whether it’s the stories of notorious prisoners, insane asylum patients, horrific lunatic asylum treatments, or the supernatural events that occurred here, your guide will have you suspiciously looking over your shoulder. The minimum age to join the 2-hour ghost tour is 12. Demonstration of electroshock therapy. It was believed to have taken place out in the centre of the ward, where others could see, rather than in a cell. Stairs up to the second level in the original prison area. The patch of loose bricks in the upper left of the photo was from one prisoner who almost managed to escape. Looking down from the tower onto the patient exercise yard. 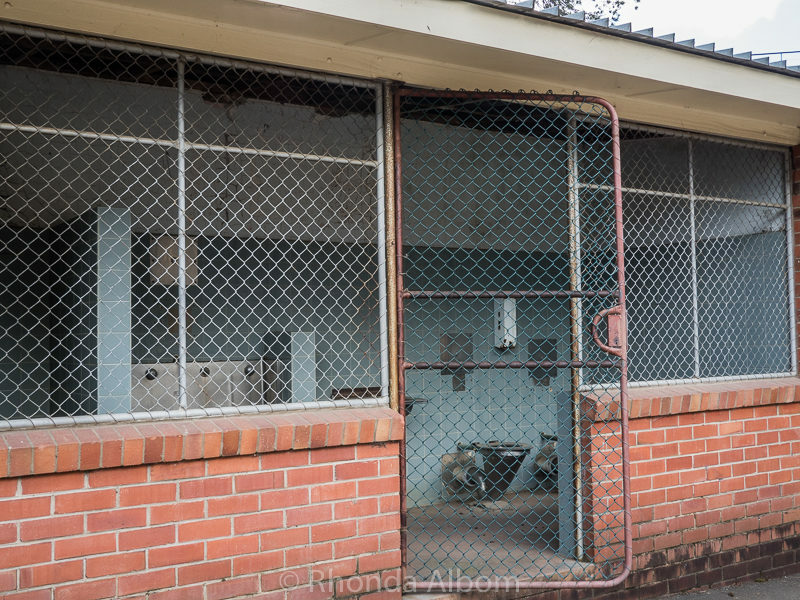 The toilets in the exercise yard were open so patients could always be watched. The original kitchen in J-Ward and our guide. The patient bathtub in J-Ward. Autopsy tables at J-Ward. 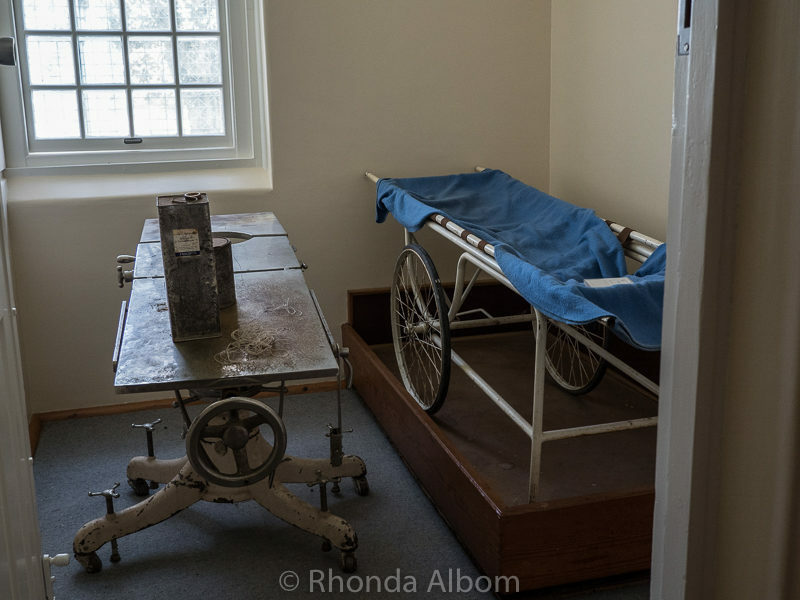 An autopsy was performed on all patients who died in this asylum. Daily tours are at 10, 11, 1, and 2 pm with additional tours at noon and 3 pm on Sundays and public holidays. Over 10, 000 people visit each year, that’s more than the population of Ararat. Read more about it on their official website. 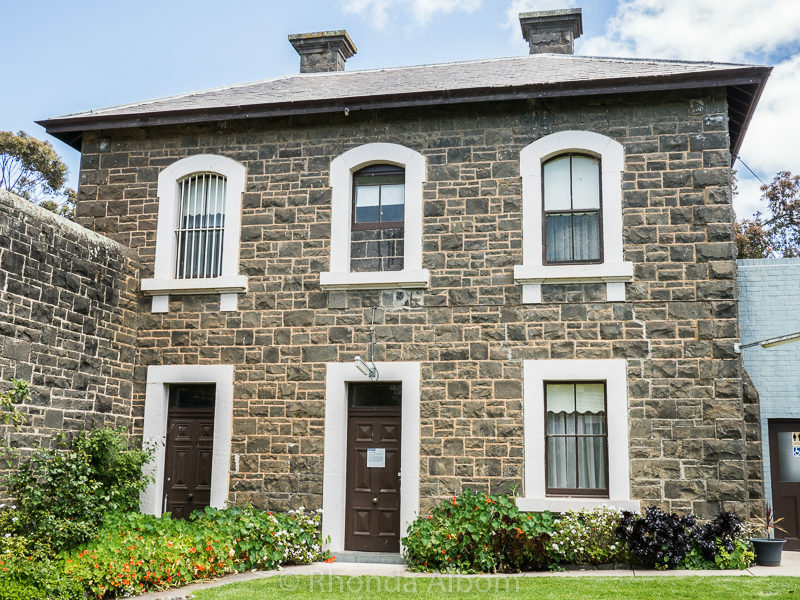 While in Ararat you might also want to visit Aradale (the asylum) and the Gum San Chinese Heritage Centre. 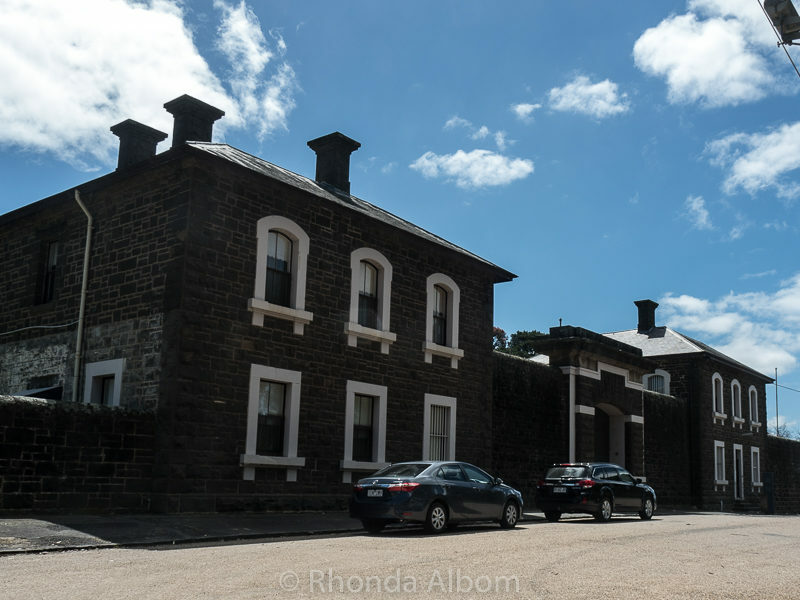 We stayed in the Grampians and drove to Ararat in the morning on our way back to Melbourne. 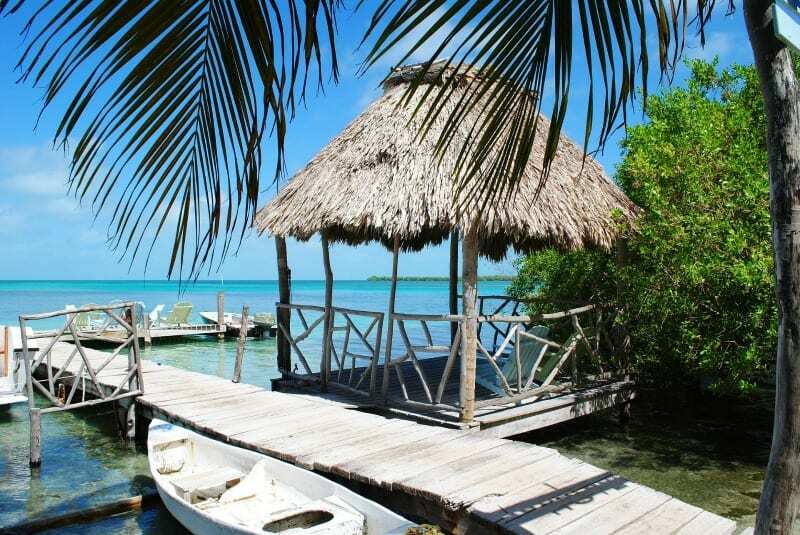 ⇒ Get the best prices on local hotels at Booking.com to or compare prices at HotelsCombined. We rented a car in Melbourne and drove a loop from Melbourne along the Great Ocean Road for two days. 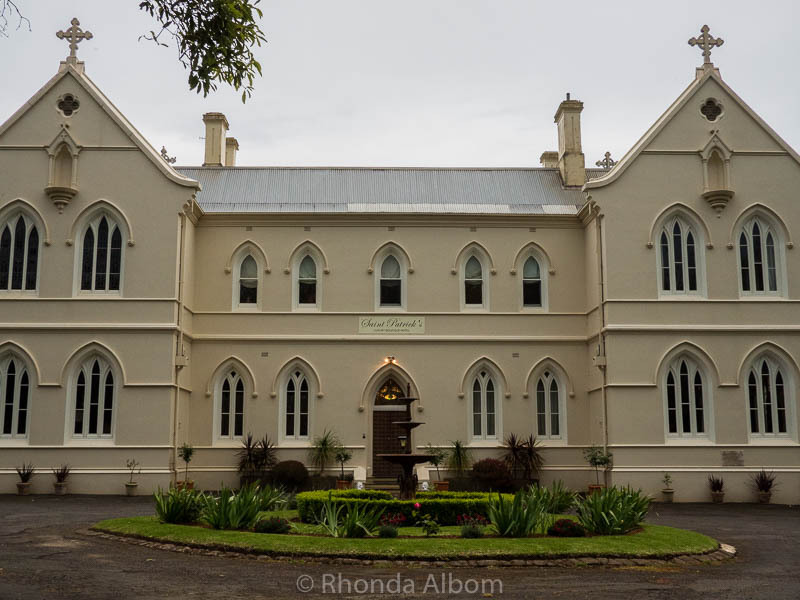 One night we stayed in a classic and stunning former convent. From there we turned inland and headed north to Halls Gap and the Grampian Mountains before stopping at J-ward on our way back to Melbourne. Rentalcars.com is where we start when we are looking to rent a car anywhere in the world. They offer us comparative pricing of vehicles from different local dealers. Their customer service is fantastic, and to date, we have never paid more for a car through Rentalcars than going directly to the dealer, and we often pay less. Had you heard of J-Ward before today? Will you visit if you find yourself in Ararat? Disclaimer: We were provided with a complimentary tour of J-Ward for the purpose of this review. However, the opinions expressed here are strictly my own. Thanks for writing this Rhonda! As a retired psychiatrist I am appalled at some of the comments and the fact that this is a ‘tourist destination’ – these people were seriously ill and treated appallingly. As it was mental illness rather than physical illness (though now we know there is no distinction between them, they are all the result of physical illness) people were treated in an inhumane way. Many of the people who offend while ill and untreated can recover and return to normal life. The stigma surrounding mental illness and the people who treat it is continued by the title of your piece and the way you write about it. When will we ever achieve parity with other illnesses? Oh my if those walls could only talk. The stories they could tell. You have to wonder what goes on in the mind of the criminally insane. Me personally I would love to be a time traveler. What say you my friend? I sometimes go to antique shops and hold an item years old or to touch a items over 100 yrs. old sends chills through me. I’m fascinated with time gone by. Thank you for sharing your story and pictures. Do you believe in another dimension? I’m not sure, but I have thought about it. I hadn’t really thought about it as another dimension, but rather as haunted all in the current dimension. What an interesting tour! I bet it’s even more so in real life! Thanks for sharing, I will make sure to visit when I am down that way. Lonely Planet is such a great source of information, isn’t it! You are correct, it is more interesting to be there, I could only touch on the information here. Plus hearing the stories with told with passion is so much better. Visiting was fine, but I wouldn’t have wanted to be an inmate. That’s kind of spooky, but the buildings are really gorgeous. I’ve never heard of it before, but I’m intrigued now. It’s a bit off the beaten path, as one would expect for an asylum. So cool! Love the little door in the giant door! And even in modern prisons in the US, the guards have to be alert for flying feces. I guess any weapon will do when you’re desperate. Yuck, I hadn’t thought about flying feces anywhere other than outside the chimp cage at the zoo. Thanks Michele, it is a very eerie place and I agree. I was quite surprised that somewhere so barbaric was still open in my lifetime, in Australia. I still feel eery visiting places like these even its years after the fact. Uhhh, feels like its for a halloween destination. It would be a pretty creepy Halloween destination. I don’t know what it is about places like this, but I find that even after decades of having been shut down, there’s usually still a feeling or a chilling atmosphere which will never leave. 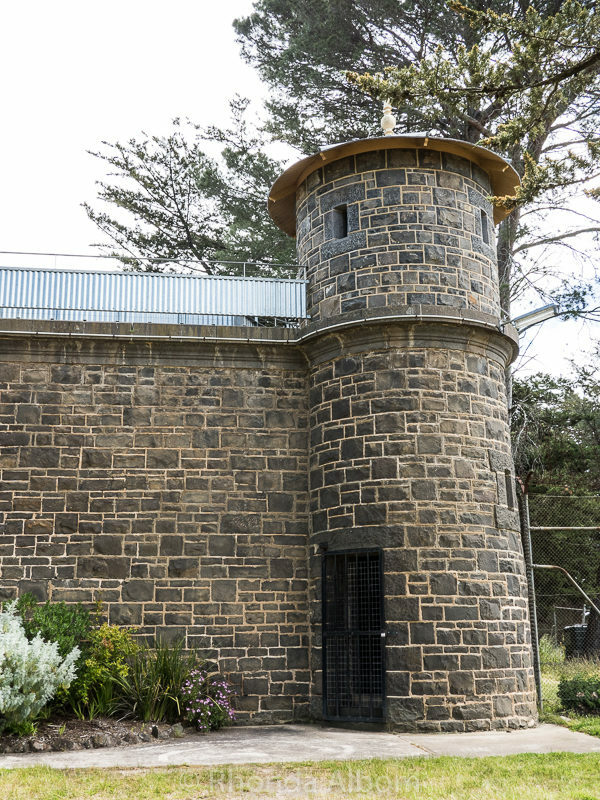 I guess it’s probably not classified as convict history, though it reminds me a lot of the sites I’ve visited throughout Tasmania which were part of our convict heritage. Really interesting nonetheless. Whoa! I’d totally go to this and then have nightmares for a good week. Going to Alcatraz was chilling, but this goes beyond. Thanks for introducing me to J-Ward. I can only imagine what it must have been like to tour this place. Very true, this is quite a bit eerier than Alcatraz. And different in that the inmates in Alcatraz did something to get there. I had shivers running down my spine just reading this, and seeing the pictures. It’s a bit off the beaten path, but perfect if you are driving a Great Ocean Road loop from Melbourne. I didn’t know about this place and probably I’ll visit it. Even though some of the things shown are a bit creepy!! When are you headed to Southern Australia? Are you including a stop in New Zealand? Will we finally get to meet? I’d heard of Ararat, I remember the name when I was travelling around Victoria, though I never got there! I had no idea there was a lunatic asylum there at all. Looks like an interesting place to visit, reminds me of Shutter Island a little bit! We stopped there as part of a loop from the Great Ocean Road up to the Grampians and then back to Melbourne. Yikes. This reminds me of that Supernatural episode. It wasn’t supernatural, but equally as off the beaten track. I remember visiting this place. Vivid chilling memories ! What a topic you selected! Did you visit with your son? I think it would have had a much different feel if I had been with my children, than just being with hubby. I’ve never been inside an insane asylum though I’ve been on tours that pass them by – which is very different. I’m not sure how well I would handle it but it sure is interesting! Agreed. They are quite different on the inside than on the outside. The stories would be intriguing, but I think the place itself would be quite depressing to visit. There is a lot of depressing history out there. We visited the asylum in Venice where the doctor did horrible experiments on the patients. It’s said to be haunted now and Venetians won’t even go near the island. This looks much more tame. The two rooms actually look like this place could be converted in to some sort of hotel. 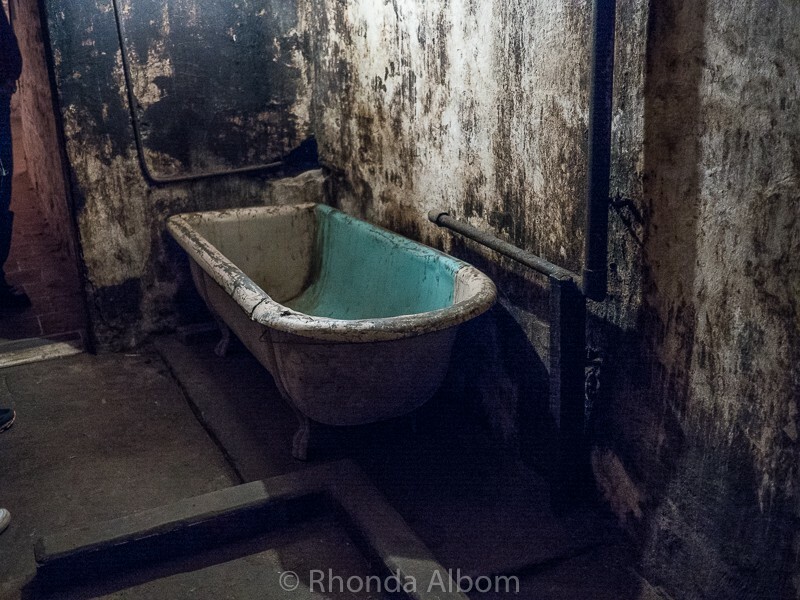 Of course, the bathtub you show is more the scenes I would expect from an asylum – spooky, dark and dingy. I would imagine all of these former asylums around the world are haunted. As for a hotel, it would be creepy, but it might attract adventure seekers. You find some fascinating places to visit. I’ve been to Ararat a number of times and have never heard of this place. What a contrast of areas around the place, some so eerie and others quite pretty. I did love the flooring in the suicide watch room and I simply adore bluestone buildings to look at. Some bits of reminded me a wee bit of Old Melbourne Gaol in the city, where Ned Kelly was hung. It is quite a contrast to the Grampians, and we do seek out unusual spots. As for the floor, remember, parts of the facility were seen by visitors, other parts were not. It might be comfy, but that’s all they get. 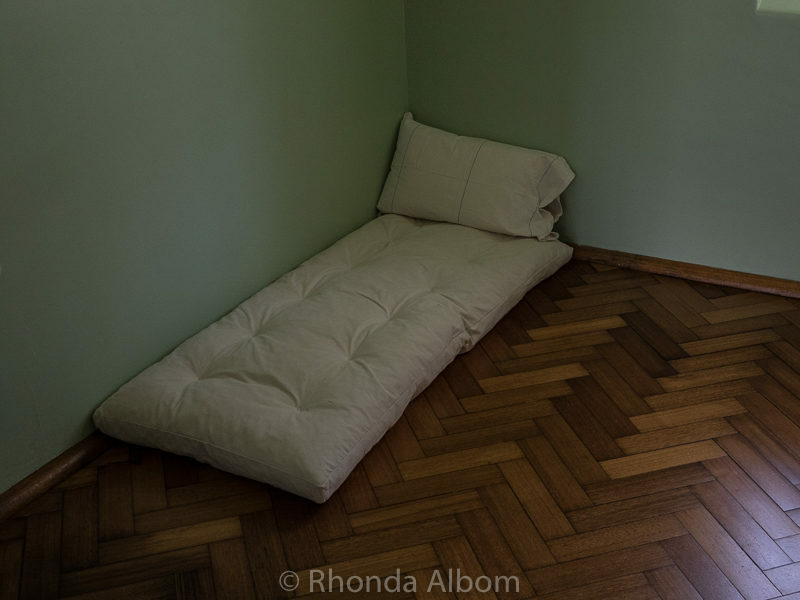 No blankets, no pillow, just the mattress that somehow can’t be cut or torn. That’s so interesting and kind of terrifying to see the conditions inside. It’s almost mesmerising when you are there. Wow what an interesting place. It’s amazing to think of the thing that used to go on there. Yes, to hear the stories was a bizarre reality. Sadly I don’t think psychiatry has come very far from these terrible days. Probably not. Although I think there are better drugs now that help a lot of people. I have not heard of JWard before but I’m pretty sure that we would want to visit. My son has a fascination with history and the gorier aspects of it. Thank goodness that mental health care has come along in the world. We went to the Bedlam Exhibit in London (on Bethlehem Royal Hospital which was a lunatic asylum) and it was a real shocker. 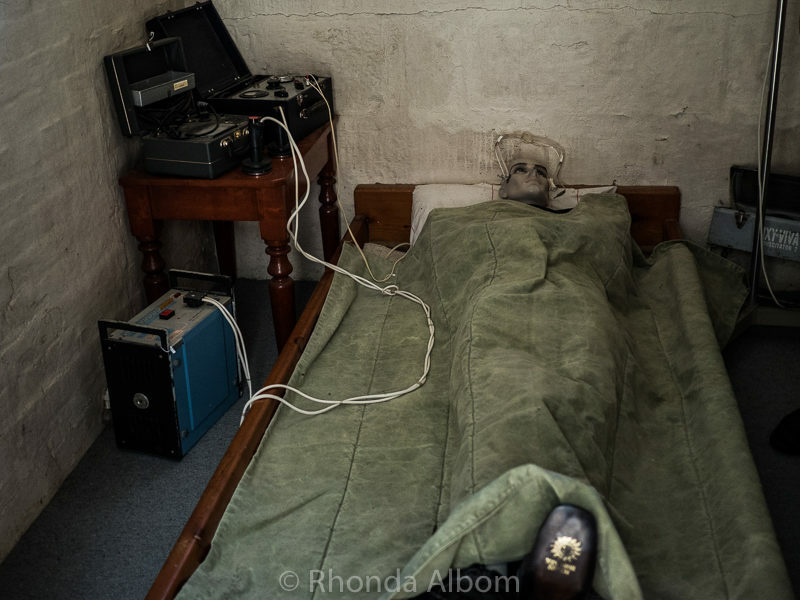 We also visited a torture museum in Northern Spain and another one in Moscow. Your son and my daughters would get on well. I never heard of this before, but it looks definitely interesting! Great information! Happy travels! We hadn’t heard of it before either. Ararat is an interesting town. This placed closed in the 90’s, less than 30 years ago, so during our lifetime. What really made the tour so interesting is that our guide knows some of the former inmates as well as some of the former guards, so his stories are amazing. Well that certainly is an ‘unusual’ place to visit. I imagine this would have been very interesting to hear all the stories. Some of the photos made it looked really nice, in stark comparison to the open toliets and bathroom! Thanks for sharing. I think that was the idea. Visitors would arrive and see only the nice areas. I wonder what determined someone as insane for a transfer? That bathtub reminds me of a scene from The Young Ones. The first four pictures seem pretty nice. I wondered that myself. I was hoping it was a medical diagnosis. I’ve dealt with people that belonged in institutions. It’s a horrible way to live ones life. Many currently are off the rails because of drugs. You have to be ever careful around them. I was fortunate to never have had an incident in my 25 years. A huge need for mental health care and mental health facilities in this country. It’s a scary world sometimes, and drugs are not helping. What an eerie place. I’ll bet there are ghosts! I think it is the ghosts that make it so eerie. Creepy! Reminds me of the Berlin-Hohenschönhausen Memorial prison used by the Stasi in East Berlin I went to a long time ago. Our tour guide had been a former inmate and had even cried during our tour when telling of the torture he endured all because he wanted to go to West Berlin and someone ratted him out. #wkendtravekinspiration (ps. I will add the link up pic soon as soon as the internet is up and running again and I’m not on my phone) Happy Holidays! While I have been to Berlin three times, I have not been to that prison. I would imagine listening to first hand accounts of events would make the hair on my arms stand up. What a fascinating, and horrible opportunity. i’m fascinated by places like that, they don’t freak me out at all! It didn’t freak me out, it just felt eerie as we walked through parts. What an interesting tour, a bit daunting, but very insightful. It reminded me of a tour of Alcatraz I took when visiting San Francisco. I have been to Alcatraz, and it was different. It is much larger and more about a prison, than an asylum.